Details relating to the Latvian Commemorative of 2015. 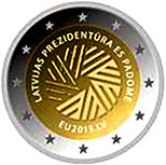 The coin celebrates the Latvian presidency of the Council of the European Union. The motif chosen for the coin is the millstone which is also the Logo chosen by Latvia for its presidency of the Council of the European Union. The millstone has a long history in Europe and has many associations, among others food and prosperity. The circular form represents unity and wholeness – the properties on which the EU is supposedly built. Around the top of the inner circle is the inscription “LATVIJAS PREZIDENTÜRA ES PADOME” (Latvian Presidency of the Council of the EU). At the bottom is the inscription “EU2015.LV”. Return from Latvian Commemorative 2015 to euro coin collector.